Back on 16 December 2008 EmployEasily Legal Services was formally incorporated as a limited company and on 1 January 2009 we officially commenced our first year of trading and as the bells struck midnight on New Year’s Eve not only were we celebrating the dawn of a new year, we were also celebrating achieving a significant milestone in the history of EmployEasily Legal Services, 10 fantastic years of trading! Over the past decade we have seen our team grow and our operations expand from being a local specialist employment law firm to being a UK wide employment law firm, providing employment law and HR advice and support and Employment Tribunal Representation not just for companies in central Scotland but for SMEs throughout the whole of the UK! Undoubtedly, the dedication and commitment of our amazing team has been key to our continuing growth and success but so too have many others, not least our clients who have put trust in us to look after all of the employment and HR needs year after year and whose demands, challenges and feedback has been invaluable in helping us to continue to drive ongoing improvements in how we deliver a fixed fee employment law service to employers that is prompt, practical, reliable, and tailored to their specific requirements at a price that won’t break the bank. 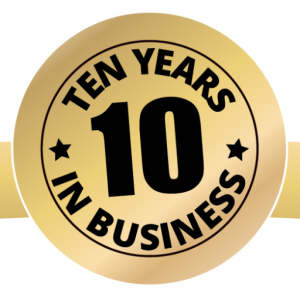 As we reflect on the past 10 years and look forward to the next 10 years and beyond we would like to acknowledge and thank all those who have helped shape our business and so to all of our clients, suppliers and supporters, thank you for 10 amazing years and we very much look forward to another 10 great years as the preferred employment law business partner for SMEs throughout the UK.